There are many factors to consider while packing for Madrid. “Should I bring a winter gloves?” “Do I need to pack high heels?” “How many bathing suits?”. Here is a cheat sheet to help you in your transition. Summer: REALLY hot. The temperature can hit up to 38°C (100° F) or more in August, and the air is dry. Autumn: Mild weather, around 15°C (60° F). Not too rainy. Winter: cold but almost never below 0°C (32° F). It may snow but only for 1 or 2 days. Although there are mountains close by with lots of snow for skiing and snowboarding. Spring: mild, hot sometimes, dry usually (can be rainy in February, March and May). Spring is very short. The weather in Madrid tends to be chilly or hot. Madrid is situated on a rather high altitude. With cold (if dry) winters and extremely hot (and even drier) summers. Madrid has 2 rainy seasons, which occur from March till May and from October till December. The great thing about Madrid is that the sun shines in all seasons. Pack what you actually need – clothes for work, clothes for play, clothes to lounge, and appropriate outerwear. All year you will need a pair of comfortable shoes for walking. Madrid has so many sights and highlights centrally located that it is very common to walk from one part of town to another. If you do decide to catch the metro, Madrid’s system is known for its abundance of steps to ensure a cardio workout on your way to class, the museum or a tapas bar. Invest in a good pair of flats and/or trainers. For the winter be sure to bring a winter coat, gloves, scarf and hat to have on hand for very crisp mornings and evenings. However, pack that right next to the bathing suits, shorts, t shirts, dresses, and flip flops that are need for the hot, dry summer months. Although Madrid is located centrally in the dead center of Spain, it is prepared to tackle the summer swelter with community pools. Here is a site with the Best pools in Madrid. Madrid’s nightlife is famously known around the world. Of course this is a personal preference, but it’s good to be aware that many of the nightclubs may refuse entry to men wearing trainers or jeans. As for women looking to dress up, kitten heels are ideal. The mix of cobble stone pavements and unevenness of sidewalks will eat your high heels. There is no need to pack 5 different pairs, pick your favorite and most comfortable and that’s all.Have no fear if you are missing something, overall clothes are pretty inexpensive in Spain. Furthermore, Spain goes “on sale” (Rebajas) twice a year! In August and again in January. You can visit any H&M, Zara, Bershka, Blanco, El Corte Ingles, etc. and get some amazing deals. 1- SAFETY MEASURES: It’s always a good idea to bring a bag that goes across the shoulder for extra safety, or a rucksack. As with all major cities, there is a risk of pick pocketing. With that said, keep your passport/ID close to your body and a photocopy in another location for good measure. 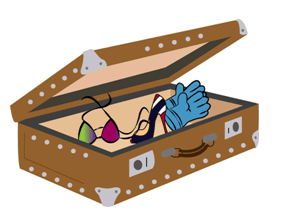 For your arrival be sure to pack your carry on with some overnight items just in case your luggage gets lost on the way. 2- MISCELLANEOUS: Spain uses 220 volt, 50 cycles, AC for its electricity. Travelers will need electrical converters to operate American appliances. A plug adapter is needed because the electrical plugs have a different configuration than those in the United States and other parts of the world. Blowdryers, flatirons, and electronics can “blow up” if you do not invest in a proper converter. Brits, even though there is plenty of tea in Spain, it is weak and just leaves you wanting more so pack your favorite if a good cup of tea is essential for you to start the day right. You can get British food in some of the supermarkets. As for the Americans, Madrid does have “Taste of America”, a store that provides American foods, varying from cereals, muffins, drinks, dips, sweets and chocolates.